If you're looking for Country Style House plans, I wrote this page to help you decide whether or not this house plan style is right for you. So to set the scene we’ll go over some of the common features of the Country Style, then we’ll go on to discuss factors to consider if you’re thinking about going for this style. Country style house plans remain the most popular house plan style in America today. They sit well in the country but also in suburbia and share the following features. Steep roofs which may have gables or be hipped. Wrap around porches on one side – or all the way round. The house will almost always have one section that is designed symmetrically, generally with windows arranged symmetrically around the front door. Small panes in the windows. 1 or 2 stories high and usually big! Is a Country style house plan suitable for your home? Flexibility – The distinguishing element of the country style home is the porch so if there is a porch that takes up a large proportion of at least one side of the home you have a country style house. So this means that the design is flexible. If the porch is adequately wide bump out rooms can be absorbed into the depth of the porch. Lot Shape – The country style, as the name suggests, suit big lots with a good amount of space surrounding all sides of the home. Porch living is a big part of the country style so there should be enough space on the lot for the home to be positioned in the best way to enjoy the porch either taking advantage of or being protected from the sun. Sloping Site – In profile country homes are wider than they are tall and it’s important to preserve this profile for the view on the approach. If the slope is perpendicular with the approach to the house something split level could be designed at the back and the balcony could still be preserved on the main floor level. Because of the space on all four sides of the home sometimes the downward part of the slope is the ideal part of the home to house the garages. 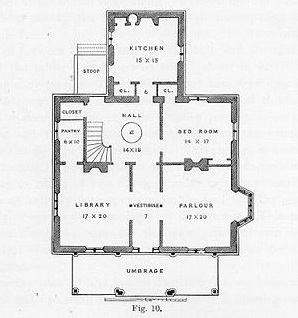 Scalability – Country houses come in all sizes. I’ve come across plans from 1,200 to 3,500 sqft. With the larger houses generally being two stories. The country style house usually has symmetry around the front door so larger homes have more windows either side of the door. Expansion Potential – The roof space, any basement and an addition are all be options for expanding a country home. Cost of Construction – Country houses can be built in a very simple shape and a porch added therefore the cost of construction can be very favorable. Of course if you go for a design with lots of corners and roof lines the cost per square foot goes up. 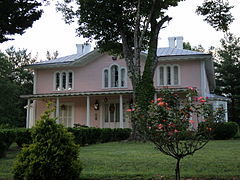 The 'country' style doesn't have as clear a historic origin as some other house styles such as 'Colonial' or 'Cape Cod'. The earliest settler homes were been built for survival and practical purposes. If you were a Pilgrim Father you had to get something up and quickly. Once the United States had been up and running for a while, perhaps the well-to-do city folk wanted to get away from it all and decided to build homes in the countryside. Many of the designs for the first 'country' homes were inspired by a book by Andrew Jackson Downing with the title ‘The Architecture of Country Houses’ (1850)’. 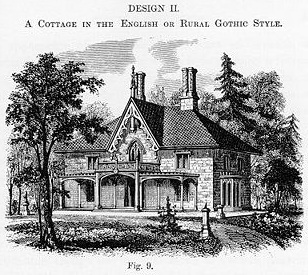 This influential pattern book combined romantic Gothic Revival architecture with the estates being built in England at the time. The money that patrons made available for the construction of their country houses meant that the designs were practical and beautiful and always with a porch so that everyone could get close to nature without venturing too far from the house. This is a photo of the exterior of Aurora, Penn's Store, Patrick County, Virginia. It was built in 1853 and is a good example of an original Country House.